One hundred years ago an arm of the Royal Navy was formed to run "suicide missions" against the German naval forces. 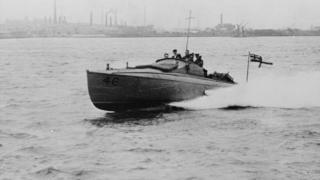 These small fast boats were loaded with mines, explosives and torpedoes and - during World War II - they became known as "Spitfires of the Seas". However, the price paid by the brave men that manned them was often dreadfully high. The most famous mission for Coastal Forces was also its most terrible. In the early hours of 28 March 1942, 15 small, wooden boats accompanied an explosive laden ship to raid the most heavily defended dock in Nazi occupied France - St Nazaire. "One commando was remarking how pretty the tracer fire, red and green, was," recalled Thomas Leary, on Motor Launch 446. "A moment later one blew the back of his head out. "I was down below with my tin hat because by now the bullets were going through (the boat) and out the other side. "If I wanted to get about I had to crawl on my hands and knees and I was lucky nothing came through at my level. "We couldn't get in (to the objective) and all of a sudden the wounded started coming down. By then all our guns had jammed and most of the other ships were on fire." While the raid succeeded in crippling the dock, only three of the Coastal Forces vessels returned and 284 servicemen were killed or captured. "Coastal forces were defensive and offensive," says Capt Trevor Robotham of the National Museum of the Royal Navy. "They patrolled in the North Sea, the English Channel and the Mediterranean. "They could be stealthy, for dropping off supplies and agents, or hit hard to disrupt enemy shipping or protect landings." The service also played a major part in D-Day in 1944, helping deception operations near Calais and protecting the actual invasion route to Normandy. This flexible role, and ability to inflict real damage on Nazi forces, has lead to them being labelled "Spitfires of the Seas". But the services' role began decades earlier, with an idea, as is so often the case, from the bottom of the military hierarchy. "While World War One had begun as a big ship war, three junior officers saw a role for small, fast craft," says Capt Trevor Robotham, of the National Museum of the Royal Navy. "Harbours and sea lanes were filled with submerged mines and nets designed to stop the big battleships, but small, light boats could get over them and get in close." With a stalemate between the battleships, the Admiralty saw the potential of fast vessels which could get past defences, launch attacks and then run for safety. Building on the designs of peacetime racing craft, a wooden machine, 30ft (9m) long and capable of speeds of about 30 knots (56kmh/35mph), entered service in August 1916. Restrictions on space and weight meant torpedoes had to be launched tail first from the back of the boat, which itself then had to swerve out of the way. Cdr Rodney Agar, the nephew of one of the first Coastal Forces VC winners, says: "They were an innovative and imaginative design, fast and nimble but designed to deliver a load lethal to far larger ships. "The result was extraordinary, basically two men sat on a torpedo either side of huge petrol tanks and ammunition. "On top of that was the nature of the fighting, up close, often at night and against a bigger enemy." Coastal Forces, with just a few dozen boats, played an increasing role in patrolling and harassing enemy shipping. Its war service culminated in the daring Zeebrugge Raid of 23 April 1918. While larger ships landed soldiers and tried to block the port's canal, the small craft laid down covering smoke and distracted coastal batteries, coming, as eyewitness Captain Alfred Carpenter put it "within a few yards of the guns". "It is remarkable that these coastal motor boats should have escaped," he added. "A single shell would be sufficient to send such a frail craft to the bottom." After the war, the boats' versatility saw them used in the covert war against Bolshevik Russia, landing spies and attacking ships. Cmdr Agar says: "My uncle, Augustus Agar, took his boat right into Kronstadt harbour, getting past forts and a destroyer screen before sinking a cruiser. "Nobody had done this before, it was a new way of fighting." With the start of World War Two, Coastal Forces was resurrected. The craft, known as Motor Launches and Motor Torpedo Boats, were larger and more powerful but still with painfully vulnerable wooden construction and explosive petrol tanks. The centenary of Coast Forces is being recognised with a ceremony and sail past by five boats connected with the service at Portsmouth Historic Dockyard on 25 August.